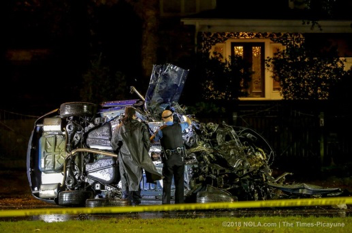 NEW ORLEANS, LA – While on route to the scene of a police shootout, a New Orleans police officer lost control of his car, crashing into an oak tree, which caused his cruiser to catch fire. Luckily, the neighborhood’s residents jumped into action. First, they pulled the police officer from the burning cruiser, and then several residents used portable fire extinguishers to put out the flames. The police officer only suffered minor injuries as a result of the crash and was quickly released from the hospital.